History of Gilbert & Becker Co.
We are pleased to introduce you to Gilbert & Becker Co., Inc. Gilbert & Becker was started in 1947 by Harris Gilbert and his partner Maurice Becker. Maurice Becker retired in 1962 and Harris Gilbert continued with the company until his retirement in 1985. Harris’s daughter Priscilla Alpert joined the Company in 1966 and was joined by her husband, Howard Alpert in 1967. In 1989, Howard & Priscilla’s son Alex Alpert also joined the company. Howard, Priscilla and Alex are all presently active in the day to day operations. 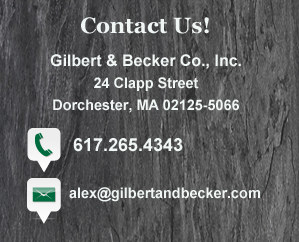 Gilbert & Becker Co., Inc. is a full service Union Roofing Contractor serving Eastern Massachusetts for the last 67 years. We specialize in slate, copper, historical restoration and are approved applicators of virtually every type of roofing system installed in our area. Gilbert & Becker is approved by the State Office of Minority and Women Business Assistance as a Woman-Owned Business Enterprise. We are members of the National Roofing Contractors Association, North East Roofing Contractors Association, Associated Subcontractors of Massachusetts, and a Charter Member of the National Slate Association. We are signatory to agreements with Roofer’s Local #33 and Sheet Metal Local #17.